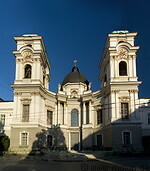 A selection of pictures of Salzburg, one of the major tourist attractions in Austria. Salzburg, the birthplace of Wolfgang Amadeus Mozart, lies in the valley of the Salzach river and is sheltered by mountains. Originally a Celtic settlement, the town developed in the early 8th century as it became the residence of bishops, who in the subsequent centuries were granted the title of Princes of the Holy Roman Empire.